Today is Rare Disease Day! This day creates awareness for all that live with rare diseases. I have multiple rare diseases. First, I had Cushing's disease, which is considered a rare disease because it affects a very small portion of the population. 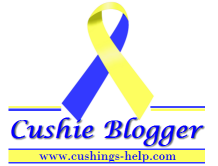 I have a feeling that Cushing's is not actually a rare disease, because many people go undiagnosed. I also have adrenal insufficiency, which is like Addison's disease without the autoimmune component. Living with a rare disease is very isolating for many people. These diseases don't have names like "cancer", that are recognizable, and your friends and family have probably not ever heard of them, and people don't understand how debilitating they can be.